Sara Ladrón de Guevara, Rector of Universidad Veracruzana in Mexico, has been chosen for the role. Sara Ladrón de Guevara has been elected the new Vice-Chair of the Talloires Network Steering Committee, effective December 1, 2018. She will replace current Vice-Chair Cheryl de la Rey, who began her service as Steering Committee Vice-Chair in 2014. The Talloires Network, housed at Tufts University’s Jonathan M. Tisch College of Civic Life, is an association of more than 380 colleges and universities from over 70 countries around the world that are committed to the civic role and social responsibilities of higher education. The Network is built on the belief that the academy does not exist separately from its communities or in isolation from society—that universities can be catalysts of change when civic engagement and social responsibility are fundamental to research, the teaching mission, and student learning. it shares and globalizes Tisch College’s vision for fostering civic engagement throughout the college experience and beyond. The new Vice-Chair, Sara Ladrón de Guevara was born in Veracruz, Mexico, and received her bachelor’s degree from Universidad Veracruzana, her Master’s degree from the University of Paris Sorbonne, and her Ph.D. from the National Autonomous University of Mexico (UNAM). 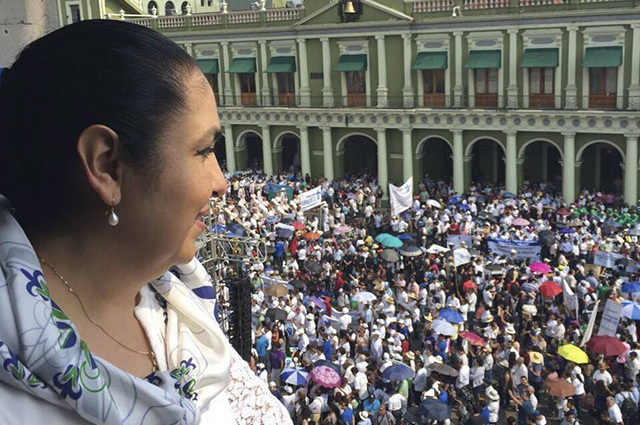 She was elected as Rector of Universidad Veracruzana in 2013 and was re-elected for a second four-year term in 2017. She is the first woman to hold this prestigious position in the 75-year history of the university. She is also a highly respected anthropologist and member of the Mexican Academy of Sciences. As an academic, Dr. Sara Ladrón de Guevara has taught at the University of Guadalajara, the Mexican National School of Anthropology and History, Smith College, the Sorbonne, and Universidad Veracruzana. She has served as director of the State Gallery at the Institute of Veracruz Culture, as Academic Secretary of Universidad Veracruzana, and as Director of the Museum of Anthropology of Universidad Veracruzana in Xalapa, Veracruz. Sara Ladrón de Guevara’s period as Rector has been characterized by a profound commitment to social justice and activism against corruption. In 2016, she organized and led a 60,000-person state-wide protest to demand the university’s public funds from the state government. This protest has come to symbolize the defense of the right to higher education in Mexico. As she opportunely points out in various forums, her objective is to highlight the commitment to social responsibility that a university has to its community. This conviction has been embedded into the goals and educational programs and of academic departments and institutes at Universidad Veracruzana, where the civic role of a university in society is fundamental. Under her leadership, Universidad Veracruzana has committed to providing services that the state government cannot provide, and plays a central role in the conservation of the region’s natural environment. As Vice-Chair, Ladrón de Guevara’s role in the Talloires Network will involve approving the Network’s annual budget and work plan, convening and leading committee meetings, and representing the Network in public communications and consultations, in addition to advising on strategic directions and program priorities and acting as an ambassador for the Network. “Since I approached the Talloires Network, I have been learning not only about institutional responsibilities, but also about the personal commitment that we have to build just societies that surround us and make our institutions worthy,” says Ladrón de Guevara. “The experiences, not only with entities or professors in institutions that are part of the Network, but especially those proposed by our young students, make it clear that we all can build a better future. “I think that, now more than ever, we have to highlight that cultural diversity is part of the richness of our world and at the same time, we must make visible the unity of goals that higher education institutions share,” she adds. She was initially elected to the Talloires Network Steering Committee in 2014. She will be the third Vice-Chair of the Steering Committee, a position previously held by Jan Reid (University of Western Sydney, Australia), who served from 2011-2014, and Cheryl de la Rey (University of Pretoria, South Africa), who began her service as Steering Committee Vice-Chair in 2014. Recently, de la Rey was appointed as Vice-Chancellor of the University of Canterbury in New Zealand. Terms on the Talloires Network Steering Committee last three years and have a term limit of two terms. Sara Ladrón de Guevara will serve her second term on the Committee as Vice-Chair. Her term will expire December 31, 2020.